A couple of days late for me but so what! He's arrived almost right on cue! Today for me the first Skylark could be heard from far high above Dalton (deforested) with just a faint rolling “churrup” call. This tells me that plenty more will come through during the next couple of weeks. Now then, I am left wondering whether this one today was a far away breeding bird just crossing over the Roof, and when would “Sky” our Dalton regular arrive back on his favourite territory on the Crag House side of Dalton? I walk through the Crags daily to reach the Hutton Roof summit and I know that any morning now I will hear him (Sky) burst into song from high, and higher, and to his gracious highest! 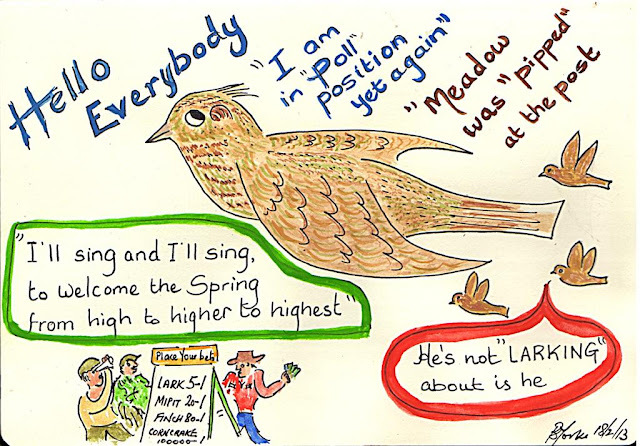 What I am sure is, he will not be doing his “Tree Pipit” mimic calls this week or next week, in fact I would not expect that perfect imitation to at least the second week of April. Coupled with these fresh, sunny February mornings, the “Lark” singing away, always brings so much cheer to most of us, giving us his special melodious welcoming in preparation of the fast approaching start to “ Wake up and get out its nature time once again”. I know exactly when things started to change for the better, it was Friday last the 15th February! Every morning up and out well before dawn, there's been little going on for me on the bird front other than the odd low flying “Oystercatcher” or the high flying “Golden Plover” passing overhead, the only other species to be seen or heard in that early morning darkness was Terence the Tawny Owl who kept his guard at various points along “Nineteen Trees”. After leaving Dalton Lane and turning into “The Trees” you would regularly see him perched in the higher branch of one of the ancient trees. Your headlights would just about catch his presence and he looked so light coloured, which makes me suspect he is of the “brown phase” and not the “grey phase”. I think most tawnie’s in these parts are of the “brown”. Slow driving is essential here, because just now and again he will swoop down almost as if to attack the car headlight, but thankfully would quickly change his direction seconds before to narrowly avoid disaster. Another great friend in those early hours especially during the latter part of January but far more so during early February was Robin who would sing his little heart out, at regular points quite near to street lighting. There were several of them competing with one another, especially as you start to descend Vicarage Lane. You never once saw them in the darkness, but could hear them clearly and with regularity. But like I said before it was on Friday last, especially during the final hour of darkness and just as dawn approached, not only Robins were much in evidence, but it was as if all the birds in the neigbourhood had burst into song and it was obvious I was witness to perhaps the first of the years spectacular “Dawn Chorus”. In addition, over the past couple of days I have seen lots of activity with the local thrushes and much aggresive fighting amongst a pair of Blackbirds, and also noticed a Crow carrying twigs and House Sparrows with nesting material in their bills, all in readiness for nest building.